ELVIS PRESLEY PREVIOUS OWNED “LISA MARIE” & “HOUND DOG” AIRCRAFT: ARGUABLY THE TWO MOST COLLECTABLE ELVIS ITEMS IN THE WORLD! On April 17, 1975 Elvis bought a Convair 880 Jet, recently taken out of service by Delta Airlines, for the then-substantial sum of $250,000. After refurbishment, the total exceeded $600,000. The plane was in a hangar at Meachum Field in Fort Worth and for months Elvis took great pleasure in flying friends out to check on the progress as the interior of the plane was refurbished to his very specific requirements (he bought another plane to make those trips – a smaller Lockheed JetStar). Elvis wanted a seating area, a conference room and a private bedroom on the plane (with space for an in flight reading library). He picked fabrics, decided on color schemes, chose the on board audio/visual system and even ok’d the fixtures in the bathroom; he counted heavily on aesthetic input from Priscilla as well. Elvis was especially excited about the fact that the same design team had previously customized Air Force I. The craft slowly came together as an airworthy mix of modern function and Graceland elegance. Close in size to a 707, the Lisa Marie was customized with plush sleeping quarters, a penthouse bedroom with a custom made queen size bed, an executive bathroom with gold faucets and a gold wash basin, a video tape system linked to four TV’s and a stereo system with 52 speakers and a conference room finished in teak. It could hold a maximum of 29 people, but usually there would be about eight or ten. When the final paint job was applied to the exterior, there was a prominent “TCB” logo on the tail. After Elvis’ death his father Vernon sold the plane in 1978 and it changed hands a couple of times. 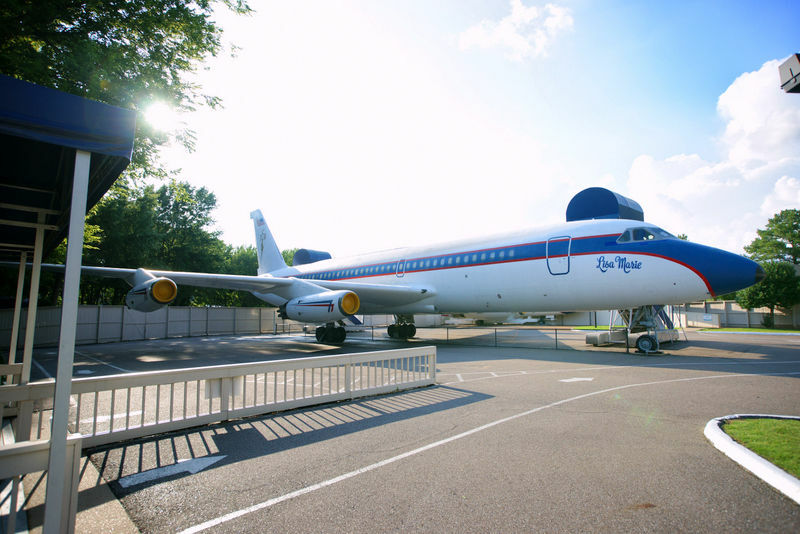 When Graceland opened to the public in 1982, EPE worked with the new owners to try to bring the plane home to Memphis. In 1984 the Lisa Marie arrived at Graceland, where it has remained one of the most popular attractions ever since. Lockheed Jetstar the ” Hound Dog 2 “. Planes are located in Memphis Tn. Please review pictures for detail. These planes are not airworthy. These are the original documented planes owned by Elvis , they have been on display at Graceland for over 30 years. We will assist in arranging third party professional shipping worldwide at buyers expense . Please ! Serious bids from qualified buyers only. All bidders must be qualified financially before bidding , please contact us before bidding – 901 482 5522. Thanks.